Taylor was more than stunning in her bridal gown. She was a joy to work with and we loved getting to know her during her photo shoot. Taylor wore a princess-style dress that had a lace corset look and it was high-necked with transparent fabric. She held a bouquet that was a mixture of red and white fresh florals. The color red was perfect for accenting her pure white gown. She wore her hair gently pulled in a side up-do and her veil was long and flowed beautifully in the wind. Taylor was so much fun to work with! Her beautiful personality showed through. She was so easy to photograph and we especially loved capturing all of her candid moments. Our camera was drawn to her sweet smile and captivating eyes. We photographed Taylor in a garden that had many beautiful archways that were wrapped with pink florals and lots of greenery. This was the perfect location to capture memorable shots for Taylor. The sun was shining and gave Taylor an illuminating glow and with her smile, she was glowing even more. From the fresh red and white blooms, to the details of her dress and jeweled headpiece, everything about Taylor’s wedding ensemble was breathtaking. Her beauty made our job easy! There is nothing that we would change about our magical bridal photo shoot with Taylor. Everything about Taylor’s photo shoot was flawless. 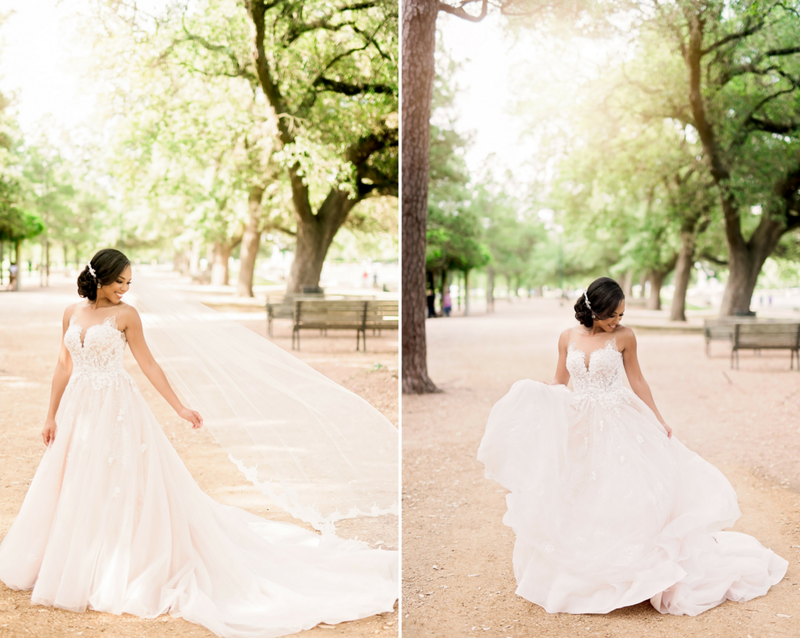 The wind was blowing in some of the shots and made her gown appear even more flowy and princess-like. She floated around the gardens and radiated beauty. The greenery that was her photo shoot background made Taylor stand out and glow. She was a vision of beauty and we were obsessing with her bridal gown because it fit her flawlessly and could not have been more perfect for this special day.